Work is progressing rapidly around the edges of the Kitsap Forest & Bay Project — an effort to protect a 7,000-acre mosaic of lowland forest, shorelines and wetlands in North Kitsap. The ecological values of the undeveloped landscape is becoming known among government officials and the public. So far, nobody has jumped in with millions of dollars to buy the land for conservation. But, as the year comes to a close, there are plenty of reasons for optimism among supporters. When I consider what it will take to make this project happen, I keep thinking of a jigsaw puzzle. I realize the puzzle metaphor is overworked, but let’s stay with it. A good way to begin picture puzzles is by first lining up all the edges and later filling in the middle. To me, that is what is happening with the Kitsap Forest & Bay Project. First, Forterra — formerly Cascade Land Conservancy — has embraced the project, bringing to the table extensive experience in acquiring lands for conservation purposes. When an option to buy the land from Pope Resources was announced, Forterra president Gene Duvernoy stated, “This is probably the most important project we can accomplish to save Puget Sound.” See Kitsap Sun, Oct. 17. Another major step came recently when the Puget Sound Partnership released a draft of its Puget Sound Action Agenda. The Action Agenda is designed to recognize the most important preservation and restoration actions that can be taken in the next two years. 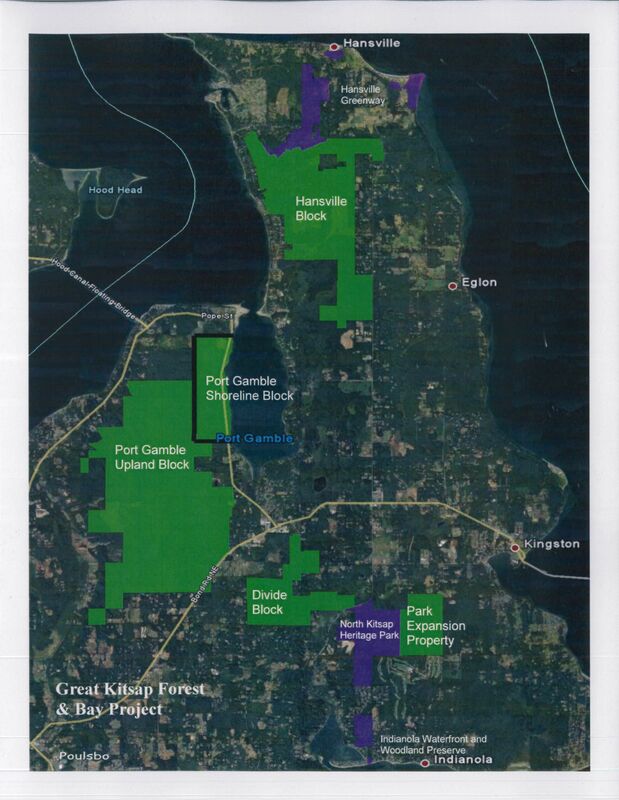 Although the actions have not yet been lined up in priority, the Kitsap Forest & Bay Project was called out as a high-priority action. Read the story with links in Kitsap Sun, Dec. 21. KUOW reporter Ashley Ahearn visited the North Kitsap property and produced a radio piece that outlines the value of the 7,000 acres and discusses the potential acquisition. She did a nice job, as you can see on Earthfix. Michelle Connor, executive vice president of Forterra, said Ashley’s story will help spread the word about the project throughout the state and beyond. Further bolstering the project is an upcoming study that will examine the ecological values of the 7,000 acres, including nearly two miles of undeveloped shoreline. A grant of $270,000 will be used to characterize ecosystem values across the landscape and determine which areas are best suited for preservation, forestry and possibly development. A portion of the grant will be used to decide whether revenues can be generated from timber harvest without upsetting the ecological integrity of the region. The $270,000 study was part of some $6.3 million provided by the EPA’s National Estuary Program for 23 grants earmarked for protecting and restoring Puget Sound watersheds. See Kitsap Sun, Dec. 23. 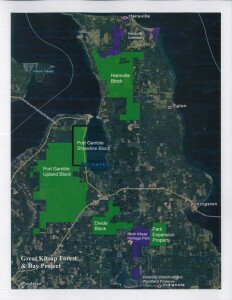 Acquisition funding for the Kitsap Forest & Bay Project will depend on a variety of public grants and private donations, each with their own requirements. At the same time, the 7,000 acres under discussion contains a variety of small ecosystems that could qualify for one or more restoration and preservation grants. The 7,000-acre jigsaw puzzle is rather formidable and almost overwhelming, but Michelle Connor is undaunted. Her optimism is infectious. Few people know as much about public conservation grants and philanthropic efforts, and Michelle has an army of people behind her. The clear strategy moving forward is to assemble this massive puzzle — with all its shapes and colors — one piece at a time.